“We started talking about this in jest 10 years ago, then more serious five years ago, and six months ago they had some health concerns and my brother, who also lives in Ohio, and I realized we can’t just run over to St. Louis when they need us,” she says. Her parents, Marilyn and Doyle Perry, retired librarian and chemist respectively, are active and healthy. They both drive, attend classes at the community college, are in a book club, attend theater and like to travel — though their days of traveling overseas are over. “I think it’s good for them to move when they have this energy. None of us know what’s ahead,” Lynne says. Whether her clients are strangers or family and friends, Lynne pretty much takes the same tack. “My approach is that the person is the most important thing, stuff is secondary. I don’t go into it with any expectations,” Lynne says. She is a licensed social worker and member of two organizational associations - National Association of Productivity and Organizing Professionals and Institute for Challenging Disorganization. Lynne’s first question to clients: “What are your goals?” She knows her parents want to move to a retirement community that offers a range of care services so they don’t have to move again, and they want to live within a 10-15 minute drive of Lynne’s Akron home. During her visit, Lynne likes to tour the house with clients as if they are on a treasure hunt, picking out items they treasure — and stuff that has little value, emotional and otherwise. “I have gathered words of wisdom including the most recent client expression that ‘time together is precious, keep the good pictures and remember stuff is just stuff,’” she says. When it comes to getting rid of unneeded and unwanted stuff, Lynne taps into the client’s motivations. Maybe a downsizer wants to make a little money and while some furniture, artwork and other items can be sold, the market is saturated with vintage furnishings, china and the like and often a client’s expectations are unrealistic. Other people just want to find a new home for their stuff and are happy giving it away. Some people just don’t know. In the end, Lynne helped him sort through his belongings and donate furnishings and clothes valued at about $5,000 to Goodwill and Habitat for Humanity, and sell furniture that netted him $3,000. Fabric and sewing machines went to a prison sewing program. “We didn’t get a dumpster, but we did call Junk Away,” she says. She makes sure clients know about one of her favorite charities — the Humane Society of Summit County. New and nearly new purses, wallets, scarves and jewelry are sold during the annual Purses for Pooches Boutique Sale to support the Humane Society. Cuyahoga County Solid Waste District’s “Pass It On” booklet is full of ideas of where to donate things for reuse. Lynne’s parents are not pack-rats and while they’ve been living in the house since 1964 it’s not a big house. Still, there will be challenges. “My dad has been working on cleaning out the basement for 20 years,” she says. Moving to a retirement community means the Perry’s will need less cookware, dishes and the like since most communities include some kind of meal plan. Living close to their children means they can get rid of bulky items, like coolers, since they can just borrow them. During Lynne’s visit to St. Louis in early March, she helped her parents put together a game plan. Her brother plans to visit soon and work on the plan with them. If they need additional help, she’ll find a professional organizer in St. Louis. She also laughed when her parents asked, “Are you going to charge us?” but then turned serious. “I feel really honored to go in and use my skills. I’m going to do my best to make it a smooth transition,” she says. We’ll check back with Lynne to see how the move goes. 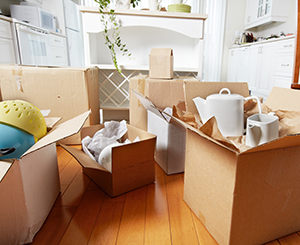 Whether you decide to hire a professional organizer like Lynne or to do the task yourself, it’s good to know what to do and what not to do during the downsizing process. Take a look at our free guide, “Do’s and Don’ts of Downsizing,” to learn more about what to give away and what to keep, 10 tips from an interior designer and tips from best-selling author Marie Kondo.